Another sheer layered, unfinished piece. I'm going to play some more with this process: 1) so I can finish these 2) so I can teach it to my Atheneaum Mixed Media with Paper & Cloth that starts on October 5 in San Diego. When you say sheer do you mean like a layer of organza? some organza, but tissues and rice paper and sheer papers too. 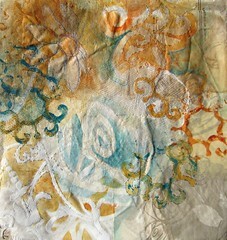 Well, dang Jane - i can't wait to take your Mixed Media class - weeeeeee!